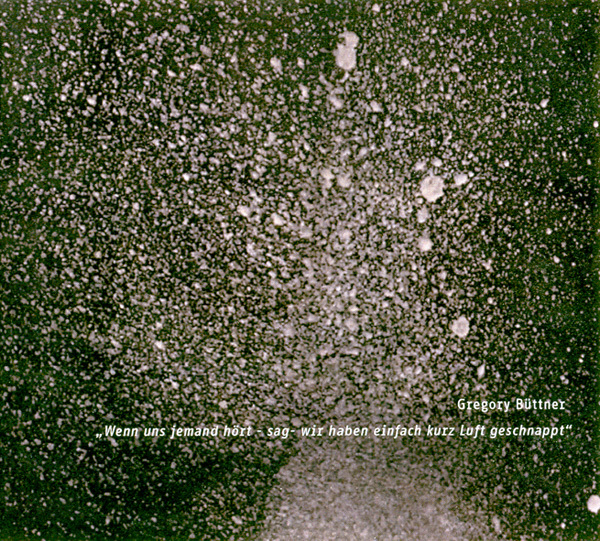 The first track of the latest release by Gregory Büttner for 1000füssler – Wenn uns jemand hört – sag – wir haben einfach kurz Luft geschnappt – re-proposes a special composition for the eponymous show by Anja Winterhalter, performer, photographer and dramatist who has for several years made Hamburg her base. Track 2 comes from another collaboration with Winterhalter and the audioplay/installation Echolot 1# Skipping Spaces. In this piece, audio sequences constructed by a machine vibrating sine waves, white noise and digital crackles were directed at specially prepared objects (e.g. cans, tubes and wooden boxes) in order to create and mix ‘metallic’ and sibilant feedbacks together. The effect is soft, acoustic and organic-sounding reverberations. The samples were then re-recorded to produce a mixture of fairly detailed and immersive sequences, dense in their infinitely small variations. Scalic jumps overlap and intertwine semi-chaotically, while always respecting a subtle harmony steeped in the electroacoustic tradition of which Gregory Büttner is a connoisseur. It should be noted that the original project of the first piece came about in 2010 and in 2011 Büttner also presented a live show with the same title at the Stark Bewölkt, a space dedicated to experimental music in Hamburg, in an ‘audio only’ production. The artist is – in short – back on the scene with this powerful and consistent release. The moods are sometimes extreme but they delicately stimulate our attention to detail with a slow expansion of treatments and atmospheres. This is a very interesting work that reconciles us with more experimental and abstract sounds.